Brisbane - Centuries from Jacques Kallis and Hashim Amla put Australia on the ropes before South Africa's bowlers landed some early blows of their own to leave the hosts struggling at 111 for three after the third day of the first Test on Sunday. The tourists were reduced to 10 fit batsmen after an injury to JP Duminy but 147 from the evergreen Kallis and 104 from the in-form Amla helped them to an imposing first innings tally of 450. The much vaunted pace attack took over just after tea and, finding movement on the Gabba track that had evaded the Australians, removed opener David Warner (4), debutant Rob Quiney (9) and Ricky Ponting (0) in quick succession. Ed Cowan, who finished the day 49 not out, and captain Michael Clarke, unbeaten on 34, restored some stability to the Australia innings with a stand of 71 before stumps were drawn. Morne Morkel took 2-25 but Steyn perhaps had the bigger impact, tempting Warner into an outside edge that Kallis caught in the slips and, fielding at fine leg, flicking a Quiney hook shot back inside the boundary rope and catching it infield. Ponting exited after he had faced just five balls when he went for a Morkel delivery well outside his off stump and Kallis again took the catch in the slips to leave Australia on 40-3. Morkel had yet to concede a run and memories of last year's Cape Town Test, where South Africa bowled Australia out for 47, were surely flashing through the minds of both teams. The tourists had resumed on 255 for two after the second day had been washed away by rain and Amla soon had the 10 runs he needed for his 17th Test hundred, a third in his last four Tests. The 29-year-old cut James Pattinson for the seventh four of his innings to reach the mark, continuing the purple patch that included a century against England at Lord's and an unbeaten 311 at the Oval. Amla had added just one more run to his tally when a Peter Siddle ball caught him high on the pad and umpire Asad Rauf sent him back to the pavilion. TV replays confirmed the ball would have gone over the stumps but Amla decided not to appeal after consulting Kallis and their 165-run partnership was over. 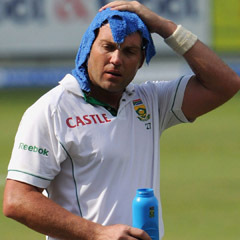 There was now a stiff breeze blowing across the Gabba but in the next over, Kallis smacked two runs through midwicket to bring up his 44th test hundred. Australian quick James Pattinson (3-93) had the experienced all rounder caught at gully by Quiney four overs after lunch and then came back in his next over to remove AB de Villiers for 40. Vernon Philander (11) brought up the 400 mark for South Africa with a huge six before he too was caught, in the slips by Clarke off Peter Siddle. Steyn survived an lbw decision off the bowling of Ben Hilfenhaus thanks to the TV review system, leaving Jacques Rudolph (31) to become Australia's seventh victim and Lyons' second. The Gabba paused for two minutes' silence in memory of the dead of the two World Wars but reflection failed to galvanise the Australians and South Africa batted on until Hilfenhaus removed Steyn (15) and Morkel (0) just after tea. South Africa's No 1 ranking is on the line in the series, which concludes with matches in Adelaide and Perth after Brisbane.